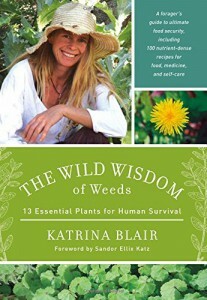 I was approached by Chelsea Green Publishing to write a review on The Wild Wisdom of Weeds by Katrina Blair. Having the opportunity to write a review on a book about my favourite topic is something I can’t say no to. Now, I must admit I had never heard of Katrina prior to receiving a copy of her book and since reading the book I have to say this woman is incredible. Katrina Blair has taken a different approach than other authors by identifying thirteen wild plants as “essential for human survival:” amaranth, chickweed, clover, dandelion, dock, grass, knotweed, lambsquarter, mallow, mustard, plantain, purslane, and thistle. Her choice is spot on because almost all of these plants grow across the globe. Climate change and resource depletion are causing many problems for us and Katrina suggests that these plants offer a local source of food and the security that comes with it. There is not a doubt that wild plants are local, readily available and provide us with the nutrients we need. • Can be used in personal care preparations. Katrina devotes the majority of her book to extensive profiles of the wild thirteen plants. Each plant profile includes photographs, detailed descriptions of plant botany, habitat, history, edible uses, medical actions, medicinal uses, and recipes, including both culinary and medicinal preparations. There are thousands of wild edible plants on our planet and it only makes sense to learn what free food is out there even if only to have some knowledge in the event of a crisis. The Wild Wisdom of Weeds is a must-have book for the person wanting to gain more intimate knowledge about these thirteen important plants and expand their collection of wild edible recipes! I encourage anyone reading Katrina’s book to read my critique as well. Nice to read this critique Russ – although long it is interesting and coming from you most definitely trustworthy. I had a woman email today asking if I knew of anyone near her who does walks and I sent Ms. Berkley your way!